Black male householders made up 16.2% of all African American Households in 2010, just slightly higher than males as a whole. 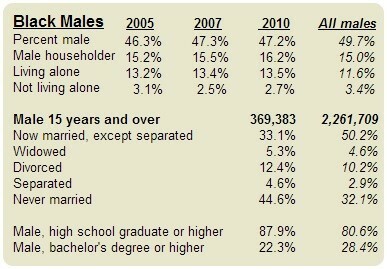 33.1% of Black men are married which is 5 percentage points higher than Black females. The scope of occupations of African American men is more evenly distributed than it is for the entire male population in the Houston metropolitan area as a whole. While the numbers of both Black men and women are over-represented in the service industry, African American women are more likely then their male counterparts to work in a management or professional occupation. African American women in Houston have lower marriage rates and higher birth rates than the Houston population as a whole. Only 29% are married. More than 56% of all Black women who gave birth in 2010 were unmarried compared to the metro average of 34.5%. 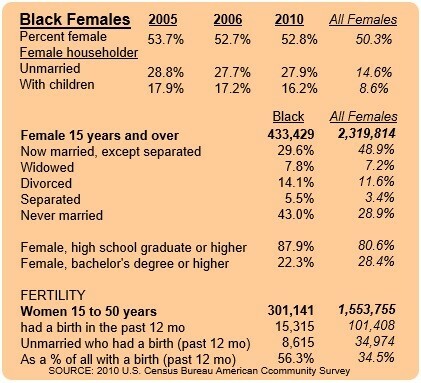 This is the cause for the large number of single mother families which in 2010 made up nearly 29% of all African American families and just almost 18% of all Black families with children. Houston has a great advantage over other cities when it comes to attracting college graduates. For one, Texas is one of the top destinations for Black college graduates. In 2010 the metro area was home to more than 96,000 African Americans enrolled at more than 60 colleges, universities and other degree-granting institutions in the area. About 15,000 of those Black students attend one of Houston’s Historically Black colleges, Texas Southern University and Prairie View A&M University. After completing school, many African American graduates choose to stay in Houston because they have discovered that the city is an ideal location to pursue their dreams. Not only does Houston benefit from college grads in terms of employment, the business climate here makes it a haven for African American entrepreneurs. According to the Greater Houston Partnership (Houston.org), Houston has 1 black-owned business for every 30 Black residents. They also state that African Americans own 24,286 businesses, which is more than one-fifth of the city’s (proper) total. 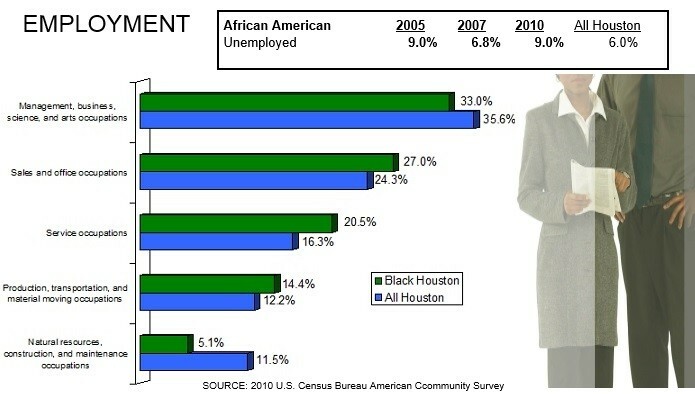 In 2010 almost 30% of the Black Houston workforce was employed in the Education and Health services sector. Houston happens to be home to the largest medical center in the world, employing 72,000. The medical center is a convenient commute for a large percentage of the Black population. The percentage of African American home owners has remained steady. This is actually a good sign due to the fact Houston received an huge influx of new Black residents as a result of Hurricane Katrina. These new migrants did not own property in Houston prior to the storm. Many would argue the percent of homeowners should have decreased after the migration. Also the percentage of Black Houstonians occupying homes built in the year 2000 and later has surpassed that of the entire Houston population. This is an indicator that African American householders are looking for newer homes, newer developments, and updated amenities. With nearly 60% of the Black population spending more than 30% of their income for rent, the need for increased homeownership in the African American community is apparent. African Americans in Houston are 10 percentage points more likely to own a home built in 2000 or later than African Americans nation wide. An established network of communities and social and business organizations. Two Black Universities in the area, one of which has contributed greatly to Houston’s Black culture and remains a strong force in the city. Strong Black media network of radio stations and newspapers that keep the community informed. A large number of Black politicians who provide the Black community with a strong voice in Government as well as a network of support for businesses and residents. A host of events and festivals celebrating Black Culture. The city received a big boost in its Black population due to Hurricane Katrina. 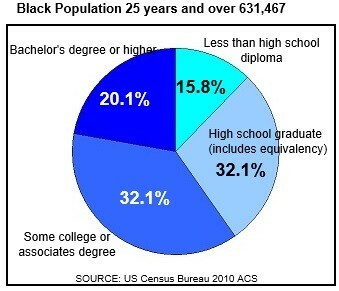 The Black population grew by almost 100,000 from 2005 to 2006 mostly due to this unfortunate disaster. The majority of migrants from Katrina is working and middle class and found plenty of new opportunities in Houston that were not available in New Orleans or its surrounding areas. When speaking of this migrant population most refer to those who were housed in the Astrodome and now populate Houston’s southwest side. But few mention that many migrants from that disaster left by their own means and lived with relatives in all parts of the Houston. They eventually established their own homes nearby or near their new places of employment. A night life that includes just about everything.